Camper and Nicholson, the oldest yacht maker in the business and whose very name is synonymous with quality - originally designed this yacht to take part in the Quarter Ton Cup rule. These yachts have a really thick and thus tough GRP layup - unheard of in more recent yachts. The Nic 30 proved to be a really tough mini-ocean racer offering roomy accommodation for her size and an exceptionally spacious cockpit which is well designed for sail handling. Seago 4 man offshore life raft. In addition to this new gear the yacht has recently been fitted with a custom built Bow roller accommodating a 15kg Rocna anchor tethered to 50m of 8mm calibrated chain – an enviable setup indeed. The running and standing rig was professionally checked July 2016. LED lighting throughout. She benefits from a good survey in 2013 when priority work required was seen to. She comes with tiller pilot, kedge anchor, danbouy, warps, fenders in fact everything you need to get going. These yachts normally sleep 5, but Blue Fin has been configured for 3 which gives her spacious and comfortable accommodation. The fore cabin is made very comfortable with custom made twin zipped quality marine mattresses. The galley is fitted with two burner gas hob, grill, fridge and sink. Heads with sink and a good sized wet locker. The high standard of the fitting out is best described by the pictures and seeing her for yourself. 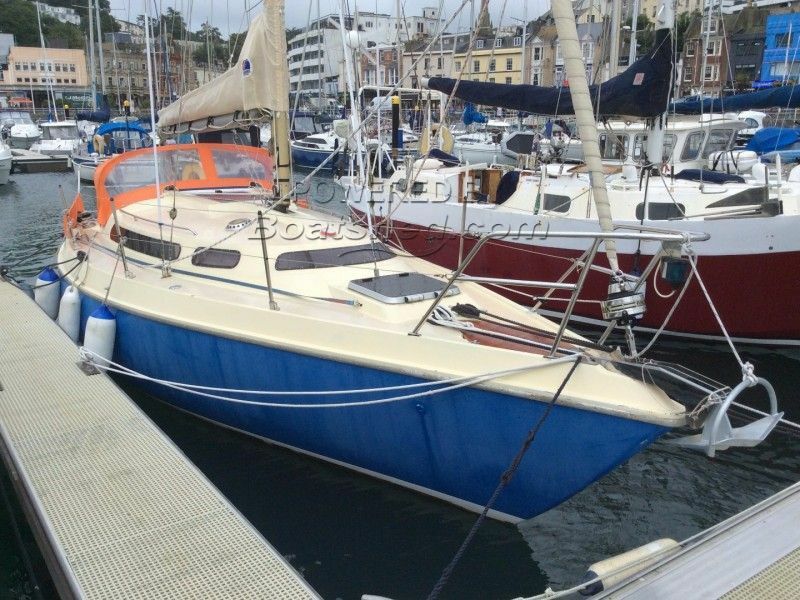 This Nicholson 30 Mk 1 has been personally photographed and viewed by Phil Key of Boatshed Torquay. Click here for contact details.